In this article we will show you, How to write C Program to find Area Of a Triangle and Perimeter of a Triangle with example. Before we step into the program, Let see the definitions and formulas behind Perimeter and Area Of a Triangle. 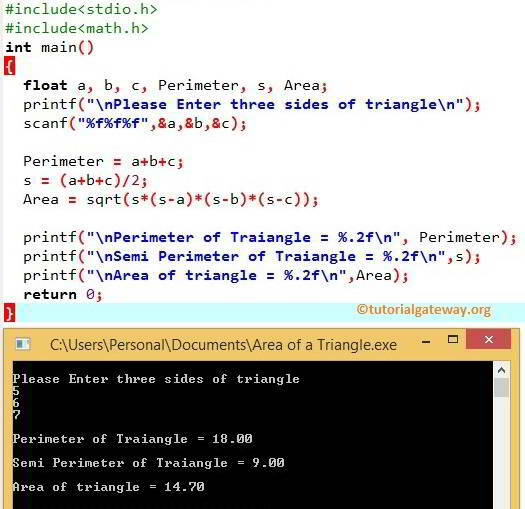 This program for area of triangle in c allows the user to enter three sides of the triangle. Using those values we will calculate the Perimeter of a triangle, Semi Perimeter of a triangle and then Area of a Triangle. Step 1: User will enter the three sides of the triangle a, b, c.
Step 2: Calculating the Perimeter of Triangle using the formula P = a+b+c. sqrt() is the math function, which is used to calculate the square root. This area of triangle in c program allows the user to enter three sides of the triangle. We will pass those three values to the function arguments to calculate the area of a triangle. Step 1: We declared the function with three arguments right after the header files. Step 2: User will enter the three sides of the triangle a, b, c.
Here we declared the semi perimeter value as s and Area. Calculating the semi perimeter using the formula (a+b+c)/2. Calculating the C Area of a triangle using Heron’s Formula: sqrt(s*(s-a)*(s-b)*(s-c)); (sqrt() is the math function, which is used to calculate the square root. Step 4: After completing the function execution then it will return the Area value.